Watch the video from the HCSP Town Hall meeting and hear Michael E. Williamson, Lt. Gen., USA (Ret.) discuss future plans. 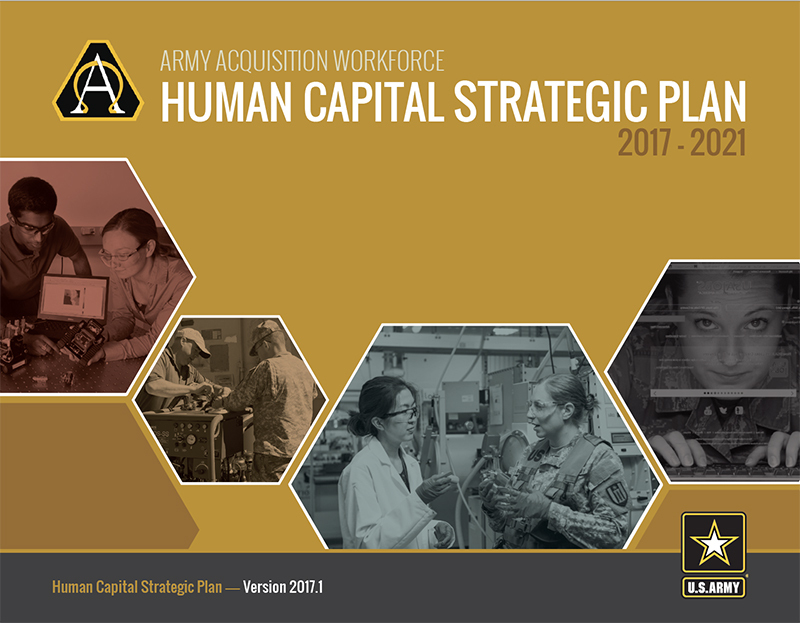 October 2016 marks the official launch of the Army Acquisition Workforce Human Capital Strategic Plan (AAW HCSP), led by the Army Director for Acquisition Career Management (DACM) Office. The AAW HCSP supports Army readiness by investing in the development and engagement of our 40,000 civilian and military acquisition professionals to ensure they have the skills needed to provide equipment and services to our Soldiers. The plan establishes goals, objectives and initiatives to support the AAW in their critical function of supporting the fight, improving the force, and building the future. Over the next five years, the Army acquisition community will work together to achieve the five goals outlined in the HCSP. People are the reason we accomplish anything—our mission to equip Soldiers is a human endeavor and requires a human capital planning process to maintain and sustain the highest quality AAW. 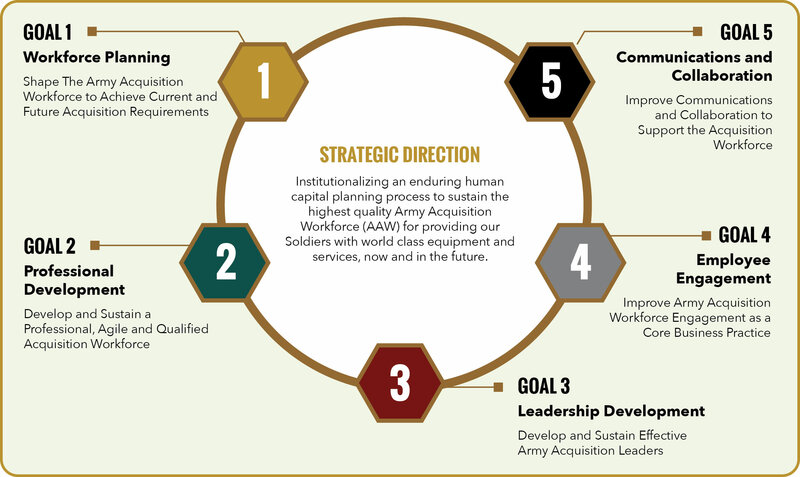 This plan is a reflection of Army’s commitment to the AAW to develop the next generation of leaders and advance the Army acquisition profession. The HCSP goals were developed by multiple stakeholders representing various demographics within commands, organizations and acquisition career fields. Based on the workforce’s greatest challenges of today and tomorrow, the AAW HCSP addresses five key themes: workforce planning, professional development, leadership development, employee engagement, and communications and collaboration. The purpose of this plan is to support every acquisition professional’s career from recruitment-to retention-to retirement by providing strategic tools and systems, effective communication products and personnel support. Learn more about the AAW. 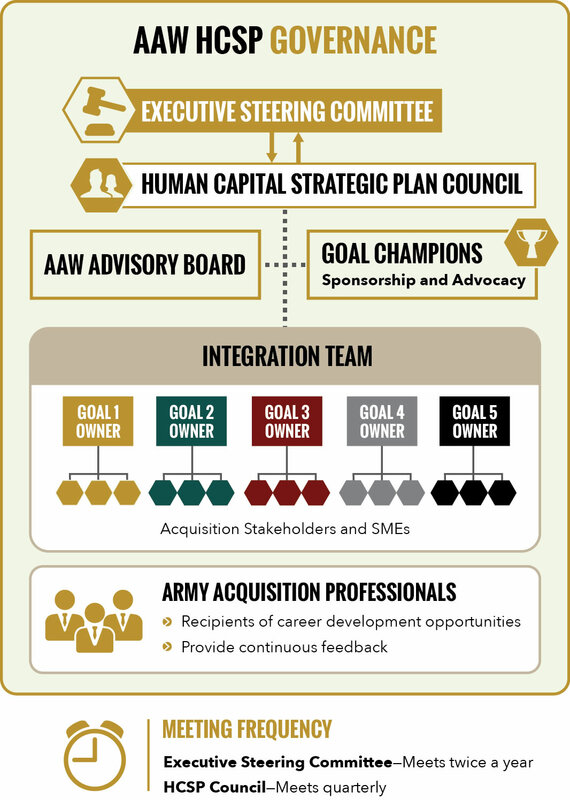 The success of the AAW HCSP and the implementation of its objectives and initiatives will depend on the commitments and contributions of the entire Army acquisition community. The governance body, comprised of key AAW leaders, is committed to the successful execution of the HCSP as demonstrated by their providing resources and leading actions needed to realize the outcomes and benefits of the HCSP. The Executive Steering Committee is co-chaired by the Principal Military Deputy to the Assistant Secretary of the Army for Acquisition, Logistics and Technology (ASA(ALT)) and Director, Acquisition Career Management (DACM) and Principal Deputy to the Assistant Secretary of the Army for Acquisition, Logistics and Technology, providing leadership guidance and perspective. The Human Capital Strategic Plan Council will conduct quarterly meetings to track the progress of the HCSP’s initiatives. Results from those meetings will be posted right here on this site. Working as a collaborative team, the Army acquisition leadership and the workforce will forge new human capital successes to continue supporting mission accomplishment, improving the force and building the future. We value your perspective, feedback, questions and ideas. Are you working on a pilot or initiative that supports one of the goals? Would you like to be involved with the plan? Contact us at usarmy.belvoir.usaasc.mbx.usaasc-aaw-hcsp@mail.mil.